I just haven’t had the words. That phrase explains so much in my life right now, and its definitely an perfect explanation of why I haven’t been blogging for many, many weeks. At first, I disappeared simply to take a little time away from all things related to infertility. It wasn’t a conscious decision, it just happened. I was considering a new job and wanted to lay low during the interview process, plus I was thoroughly enjoying summer and pretending that I wasn’t infertile. I fully intended to return to the blog as soon as our first of three embryo banking cycles began in July. But that plan and the excitement of those cycles seem like a distant memory after all that has happened over the last several weeks. It started with a phone call from my sister on June 23rd at 2:30 in the morning. There are very few phone calls at that hour that bring good news. I could tell from the tone of Kelly’s voice that this was going to be bad. Dear God, I thought. No! What is it? Who is it? Images of everyone I loved passed through my mind in the few seconds it took for Kelly to tell me what had happened. Was it my Mom? My brother, sister, or— God help us—one of my three precious nieces? It wasn’t them. But it was bad. Real bad. Brianna is my 17 year old cousin, one of two children of my late father’s youngest brother. She was driving home with a friend from a fishing trip at 10:30 that Sunday night. A man (allegedly) operating under the influence with 6 previous DUIs ran a stop sign and crashed into her causing internal bleeding that could not be stopped, leaving her friend in a coma and facing months and possibly years of rehabilitation. In an instant my cousin was gone and her friend’s life and the life of everyone she knew was forever changed. Two days later we loaded up the car and went to Kentucky to spend time with the family and attend the services. It was hands down the most moving, difficult, and spiritual service I have attended. My Aunt Tonya, Uncle David, and Cousin Brice were inspiring. They were so strong as they stood for hours greeting people, hugging them, and offering comfort at a visitation that went nearly three hours longer than scheduled due to long lines for a girl who had clearly made an impression on so many. Such an impression, in fact, that four people accepted the pastor’s invitation to come forward during the service to learn more about accepting Christ. That’s not something you see every day and helps paint a picture of Brianna. It says volumes about the kind of life she lived. Her memorial service also greatly affected me on a very personal and spiritual level. I privately decided to rededicate my life to Christ. I know others in the family did the same but none of us felt a funeral for one of our own was the time or place to go up front to declare this decision to the world. We spent the next few days in Kentucky, sad to be together for such a terrible reason, but finding comfort and peace in being with our extensive family there. Our last night in town we sat outside late into the night talking to Brice, Tonya, David and the whole Taylor clan. 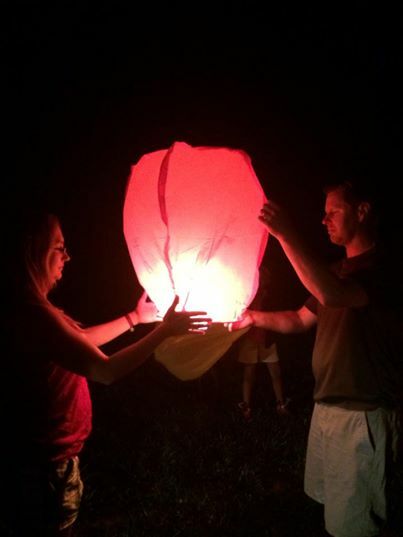 We told funny old stories and lit Chinese lanterns in Bri’s memory. It was somber, but I left Kentucky feeling like even though the family would never be the same, we were going to be ok.
We travelled to Kentucky in a caravan of Michiganders with 4 children under the age of five. It was a 10 hour drive which easily became 12 with bathroom breaks and food stops. 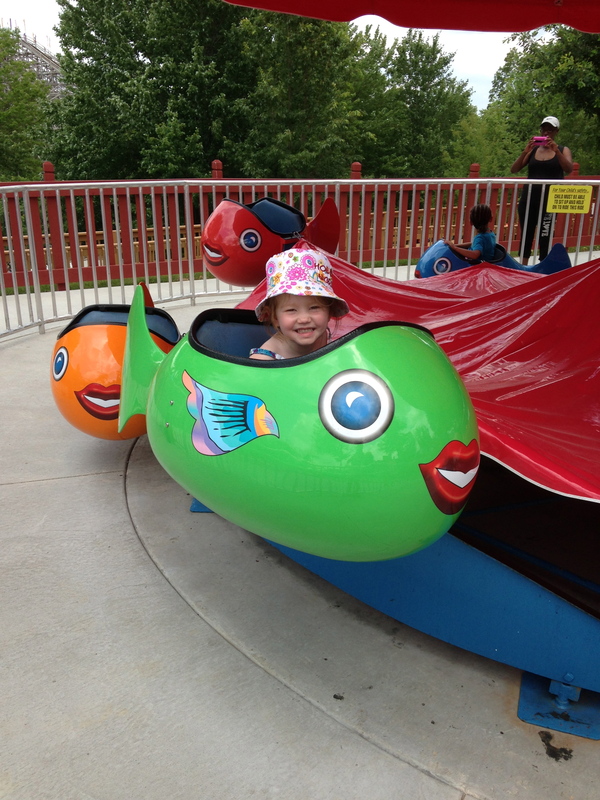 The kids had been troopers all week so we decided to take them to Holiday World in Indiana on the way home. We learned from what happened with Bri that we should embrace time with family while we have it. We aren’t promised tomorrow. The kids had a great time and we arrived home Sunday afternoon physically and emotionally exhausted. I went to bed that night thinking that while we had many years of pain and healing ahead, the worst was behind us. Early the next morning I awoke to another phone call from my sister Kelly. Again the unusual hour and shaking in her voice told me that I was about to hear bad news. When she told me what happened, I thought she was joking. But this kind of prank would be far too cruel for anyone to play. 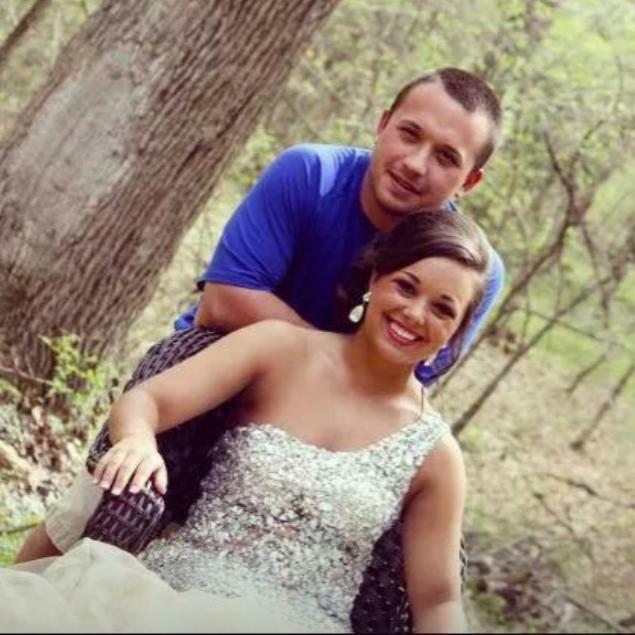 Late that Sunday night, almost exactly one week from the moment of Bri’s accident, her brother Brice was in an ATV accident. He was driving home from a small memorial service at a friend’s when a deer ran through the parking lot of the church where services for Brianna were held just a few days before. His parents were right behind him on a side by side and saw Brice hit the deer. He wasn’t driving fast or irresponsibly, nor was he wearing a helmet. Brice sustained serious head injuries but it took doctors several days to understand the extent of the damage. We were told the first 72 hours were critical. The waiting was excruciating. We were still in a stupor from the loss of Brianna and emotionally and physically depleted from our two day trip home. We didn’t know if we should head back to Kentucky immediately in case it was our only opportunity to say goodbye, or to wait to hear the prognosis knowing that these types of accidents can require years of recovery time. I will never forget being on our sun porch on July 3rd when we received that call, breaking down and hyperventilating when my brother told me that Brice wasn’t going to make it. I don’t think my two year old daughter will forget it either. She was so worried about her Mommy and why she was crying so hard in Daddy’s arms. Brice officially passed on July 5th. We headed back to Kentucky again for Brice’s services on July 9th. This time wasn’t as inspiring, there was too much heartache and earthly worry for that. Plus there was media. The service was held in a much larger church to hold the anticipated crowds and was televised live on the local news station. As different as it was, it was still too much like Brianna’s funeral, but instead of smiling and showing us hilarious selfie videos of Brianna, Brice was being laid to rest. It was surreal and I was already starting to question my newly reinvigorated faith. We stayed in Kentucky a few days after the service to be with family and to celebrate the birthdays of both Brice and Bri. Brice would have turned 21 on July 10th the day after his funeral, and Brianna would have been 18 on July 11th. We once again released Chinese lanterns at an informal family potluck between their two birthdays. As we lit the lanterns we listened to the songs that were created for each of them and played at their funerals. We watched in awe as the lanterns flew into the night sky toward a pair of stars, the only two visible stars that night. As we listened to their music, the lanterns lined up in the distance to form a perfect cross and headed straight toward those two stars. I knew at that moment Brice and Brianna were with both my earthly father and my Heavenly Father. My faith would never be shaken again. We haven’t been the same since then and we won’t ever be the same as a family. My faith is strong and my heart is full of peace and love, but there is still great pain. In fact I think the whole thing was so unbelievable that we haven’t even begun to fully experience the pain. The distance from my family in Kentucky makes that hard too. We have postponed our next IVF cycle until October. But even now I can’t imagine pouring my energy into trying to get pregnant again. I will pray on it and put it in God’s hands the same way I do everything else now. At least there is that. I now fully trust God and know that I can handle anything life throws at me. I believe in a greater purpose and have turned over control. Up to this point I never believed that “everything happens for a reason.” Its a topic my middle sister and I have long been at odds over and I still contend that its just not true, but for a far different reason than she might expect. This experience has taught me beyond a shadow of a doubt that everything most certainly does not happen for a reason, everything happens for a million reasons. Two siblings were called to be together in heaven, surrounded by a love greater than any they could know in this life. At their funerals, four souls were publicly led to the love of Christ at along with countless others silently moved to believe anew. Many people were given new hope and perhaps even a chance to know God when they received Brice’s organs. And of course, a 38 year old woman was given new peace about infertility, a new appreciation for her family, and a renewed faith in God. I am not naive. I know that while much good has and will come from these terrible tragedies, much pain has come too. I just pray that God continues to surround those in pain here on earth with love and the assurance that someday we will be reunited with them and His purpose will be clear. In weaker moments I feel guilty for the way my life has changed for the better. Sometimes I fear this happened for just for me. I fear that it took something so terrible to get my attention and cause me to cultivate and nurture my faith in ways I haven’t in years. But then I remember that I am not the only reason. That there are a million of them and the beauty and purpose of all this will become clear to us someday. Until then, we will pray every night for those who are hurting. And we pray every spare moment for my aunt and uncle. May God give them peace today, and joy again someday. That’s all I can muster for now. There is so much more to their stories, but its hard for me to tell. This doesn’t mark a return to the blog for me, I am still not ready for that. But its a start and hopefully a step toward healing and understanding too. My heart breaks for you and your family as I pray for continued peace for all of you. You have written such an incredibly beautiful post and I’m so glad to see how you have all come together to support each other. Thank you for sharing a piece of yourself with all of us. Please know that I am thinking of you guys often! Thank you. I’ve been wondering about how you are doing and will catch up soon. I do not know how to find the words, but I want to thank you for sharing this terrible, haunting, devastating yet faith-filled story. And to send love to you and peaceful thoughts and prayers out to you and your extended family. I am so, so sorry for everyone’s tremendous loss. Thank you my friend. Prayer is what we need! I’ve been thinking of you and miss my old wordpress friends. Thank you Chon. I’ve been thinking about you all and hope to get caught up soon. what a tragedy. this must be unbelievably hard for you and your family. i wish you peace and hope with time you will all heal. what beautiful tributes to them both. Thank you. We will make it through…and support is appreciated. Oh my goodness. What unimaginable tragedy. I am so sorry for you and your family. Your family is in my thoughts and prayers. I am so sorry for your losses. So heartbreaking. I am in tears reading this. I can’t imagine losing two children so close together. Thinking of you and your family. I appreciate it my friend. All the Taylor family remains in my thoughts and prayers. Especially as time ticks on and everyone else returns to their normal life. Your loss is deep and is something most of us can not relate to but rest assured, your family is one of a kind and will come through this stronger than ever. Thank you Melody… For laying the groundwork that brought me to where I am today. Love you. Thank you friend. Slowly making it back to life in our new normal. Alisa, I can’t imagine what you and all those who love them must be feeling. May Brianna and Brice find each other in the halls of Heaven and may peace and acceptance find you all. I can’t believe my eyes as I was reading your post, such tragedies at such young age, my heart aches for their parents and the rest of the family. I’m so very sorry you had to(and still are) going through this extreme period of time, dealing with IVFs and family loss. 1000 Hugs, be strong with your faith and know we now share your pain and strength! Oh my goodness. I surely can’t even begin to understand the parent’s pain, or really the entire family’s pain. I’m so very sorry… I do believe that everything happens for a reason, but that sometimes in life it takes many years, or longer, for us to be made aware of these reasons. I guess that is where our faith comes into play. I’ll be praying for you and your family. My heart truly breaks for you and your family. The road ahead will be hard for your family and friends, but it is not insurmountable. I say this, because I know in my experience this to be true. When I was 14, my mom and sister were killed in a car accident. Half my family was dead in an instant, the other half survived (I was the only one not in the car). I will never forget those moments, ever. But, I choose to cherish and honour the memories I have and to hold on to the joy of there memory, not the sadness of there deaths. I wish you the absolute best as you continue the process of grieving and living. Should you ever want to talk more, please feel free to reach out to me via email. Thank you so much for sharing your story. I am so sorry that happened to you but happy you have peace with it. Just awful! A blog about a family growing in numbers, faith, and love through good times and bad. The trials and tribulations we lesbos go through when wanting to be mommies! Where the heck did the stork leave my kid? Just me trying to survive twins and motherhood. Muddling through a domestic world in an age of social media guilt and envy.